Arina created this breakthrough DELICIOUS product for her rich and famous Beverly Hills clients. The Complete Protein System has been used as a primary nutritional element during her legendary body shaping transformations for athletes, actors, models , housewives (general and post-pregnancy), and entrepreneurs. A key element of the Complete Protein System is that one can enjoy it without the bloating that often occurs with other protein powders. As well, it is also one of the only protein powders that is nutritionally COMPLETE. • MIXES WITH SPOON – Don’t need a blender or shaker, but you can use one if you want to! I live a very active and healthy life so putting only the best and organic products into my body is a must. Arina’s protein powder is as fine in texture as is the discipline reflected on her own body. It tastes very smooths and melts like butter, no chunks of powder unlike with other brands. Her powder is also significantly lower in sodium than other brands so she’s got you covered from retaining more water. Having no artificial ingredients whatsoever is the best thing of it all as I no longer feel heavy and bloated after drinking a protein shake. The vanilla flavor is so settle and tasty. If you’re looking for a powder that meets and exceeds today’s standards and a powder created by a true professional, grab Arina Manta’s complete protein system. Arina Manta’s protein makes me feel great. It improved my skin, hair and strengthened my immune system. The protein helped my digestive system, I don’t feel bloated when drinking it. I developed lean mussels mass and lost extra weight. The protein shakes increased my satiety and delivered essential nutrients necessary for my body. It improved my metabolic activity. And it tastes like a yummy dessert. Once I tried Arina Manta`s Complete Protein System, there was no looking back, you can say: “Good Bye to Bloating”. After having a protein shake, beside that the vanilla flavor is amazing, it’s also all natural made with no artificial sweeteners, flavors or colors so, I feel great drinking Arina’s Protein knowing that I am not putting toxins into my body like with other protein powders sold on the market. 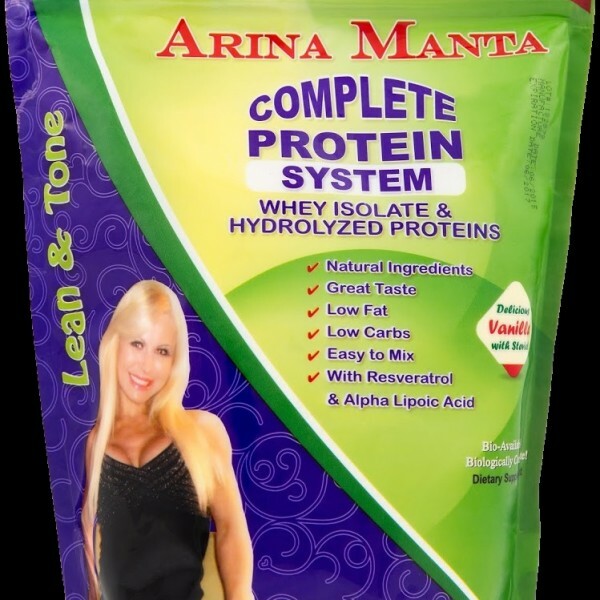 Arina Manta’s complete protein truly is the best in the world. It has the nutritional quality unmatched by any other protein product. The best thing I love about Arina’s protein is the taste! It tastes absolutely delicious! My whole family loves it! Two teenagers, my fussy husband, and myself. It’s so convenient to have 1 product the whole family loves. Thank you Arina for developing such a revolutionary protein powder! You are the best! I have been using the Arina Manta Complete Protein System for over a year. Whether I add it to my oatmeal or have it in a smoothie, it always tastes incredible. Its a rarity to get a great protein source that tastes amazing and has no sugar, no fat and no artificial ingredients. There is absolutely no clumping or aftertaste. It doesn’t leave you bloated and its super easy to digest. I take it with me to work everyday and even when I travel. I would NEVER GO BACK to any other protein powder. I recommend it to everyone and they all say “THANK YOU.” I will be using the Arina Manta Complete Protein System for life. Arina created an extraordinary product. Your protein powder is THE BEST!!! I have gluten, corn and dairy intolerances and as you know eating and drinking I have to be extremely careful for ill bloat and feel quite “yucky for a day or so if I consume any or all of those ingredients. Your protein powder is THE BEST!!! It’s like no other protein powder I have ever had. It`s so good I can drink it all day long without a care in the world!!! Arina, I really love your new protein. Protein I have ever tried. The high sugar products on the market. I have been replacing high sugar vanilla syrup with your protein powder adding a little vanilla bean and it is So delicious I don’t notice the difference.